Supplying renewable energy from wind in the High Plains and solar in the Dessert Southwest will require multi-billion-dollar investments in extra-high voltage transmission extending across state lines. Renewable resources have the potential to generate a far higher percentage of the electricity in the US than they do today. The lack of adequate electric transmission capacity is a primary obstacle to achieving this goal because many of the best potential renewable energy resources are located in rural areas far from population centers. The full extent of the current shale gas revolution would not be possible without the rapid expansion of natural gas pipelines in the prior 15 years. Over 11,000 miles of interstate gas pipeline were built between 2000 and 2007, while only 668 miles of high voltage transmission was been built in the same time frame. Because of the long distances involved in bringing renewable wind and solar power to urban areas, transmission lines will often not benefit the local states they run through. Transmission Planning has historically been accomplished at the state level. Now there is a growing call to balance overall national needs and get FERC more involved in the planning process. Transmission constraints are impeding RPS implementation in large portions of New England, transmission congestion is inhibiting renewable energy use in New York, and import constraints from the Midwest ISO (MISO) are restricting transfers of renewable energy into the PJM Interconnection (PJM). The deregulation of America’s utilities in the 1990s encouraged companies to transfer power over long distances. The regulatory regime shifted the operations of the electric utility industry, creating larger and more frequent bulk power transfers across a transmission system designed largely for local intrastate service. At the same time, regulatory uncertainty and increased competition led to reduced investment in new transmission lines. While the United States has hundreds of thousands miles of high-voltage transmission lines, only 668 additional miles of interstate transmission were built in the first decade of the 21st Century. As a result, some parts of the system have become increasingly congested. The transmission siting process can be a difficult debate. A mixture of local, state and federal government agencies hold jurisdiction over who can build what, where they can build it, when they can build it and who pays for it. Cost allocation reform is one of the most difficult issues facing transmission service providers and regional market operators. A Dec 2010 FERC decision stating that all parties who benefit from new transmission in the Midwest must share in the cost of building will facilitate construction of new transmission lines. The decision is the culmination of a push over much of the last decade by renewables advocates in the Midwest to get utilities and transmission system planners and operators to think more about wind power but is expected to apply where new wires are built to accommodate other renewable energy resources. There is an important distinction between building new wires and incorporating digital intelligence and communication capabilities into a wires network. They are potentially related, but different, and should be treated as such. The application of digital communication technology in the wires network falls disproportionately in the distribution network , not in the high-voltage transmission network. Transmission Planning is also different from some of the interesting approaches to transmission line control and sensing, including ideas for self-healing autonomous networks. Load is growing at almost double the rate of growth in transmission capacity and most regions have very limited plans to expand generation and transmission facilities. Traditional planning and operations practices, the current delivery infrastructure is not capable of bringing renewable-energy generation online at a capacity that is consistent with the amount of construction needed. The contribution of demand response, energy efficiency and distributed generation. those policies within one year of enactment. 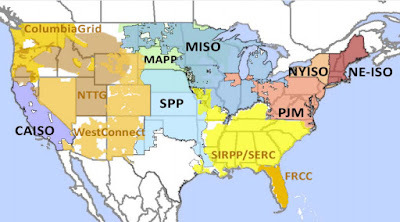 Transmission planning entities to develop regional plans and submit them to FERC within 24 months. The Commission will encourage joint submissions and submission of interconnection-wide plans. FERC may require modification of submitted plans to ensure conformance to planning principles and to reconcile inconsistencies. FERC to periodically evaluate whether projects in the interconnection-wide plan are being developed, and if not take actions, in accordance with other provisions of law, to address identified obstacles. Make recommendations to Congress for further actions or authority needed to ensure development of timely projects. Update the plan every three years. Allow States one year from time of filing of a proposal to site a high priority national transmission project. Give FERC jurisdiction over siting when states have either been unable to site the facility or have denied the application. Jurisdiction is over facilities 345 kilovolts and above that are included in the transmission plan. FERC must establish, by rule, appropriate methodologies for allocation of costs of high priority national transmission projects. Give the Department of the Interior lead agency status for development of records of decision on public lands. Avoidance Areas - Areas within Candidate Study Areas and/or Renewable Energy Zones where development of renewable energy resources should not occur because of purpose, policy, or other restrictions related to environmental, land use or other issues. Busbar Cost - The per megawatt-hour revenue that a project would have to earn in order to break even on all development and operating costs, other than network transmission. Busbar cost includes any collector lines bringing power from dispersed generators to a central interconnection point on the transmission system. The busbar is the point at which the aggregate output of multiple units is metered, and is the point at which the units become subject to power-control area dispatch instructions. CSA - Candidate Study Area - An initial modification of National Renewable Energy Lab base resource maps including any criteria identified by the work groups for Zone Identification and Technical Analysis and Environment and Lands. The Candidate Study Areas incorporate filters to identify a minimum threshold of developable resources, as well as state/province specific criteria. Identifying CSAs is an interim step the WREZ work groups will take in the process of developing proposed Renewable Energy Zones. Collector Line/System - A single or group of transmission lines that links one generator or a group of generators to the bulk power grid. Small generators will likely be dispersed throughout a REZ. The collector feeder lines from the generators will all converge at the centroid that connects to the bulk transmission grid. CTPG - The California Transmission Planning Group - An industry lead forum for conducting joint transmission planning and coordination in transmission activities to meet the needs of California consistent with FERC Order 890. CTPG is developing a California state-wide transmission plan to meet the state's 33% by 2020 renewable portfolio standard (RPS) goal and is using the Renewable Energy Transmission Initiative (RETI) conceptual plan as a starting point. 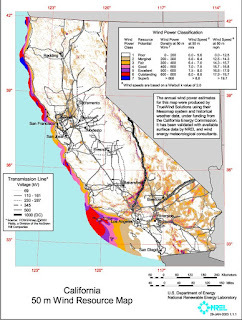 CTPG issued its Draft Final 2010 California Transmission Planning Group Statewide Transmission Plan in February 2011. DRECP - Desert Renewable Energy Conservation Plan - an attempt to balance renewable energy development and conservation on 22 million acres of desert land in California. While 20 million acres would become conservation lands, 2 million acres would be set aside as suitable for renewable energy. Proximity to transmission and previously disturbed lands are priorities within the land favoured for renewables. The draft DRECP constricts the amount of land available to renewable energy developers by further rolling back most of the variance lands BLM identified in the 2012 Solar Programmatic Environmental Impact Statement (PEIS), . 80% of the DFA's in the draft are on private land. The draft plan is the result of six years of work led by the US Fish and Wildlife Service, the California Department of Fish and Wildlife, the Bureau of Land Management, and the California Energy Commission. Ordered by California Governor Executive Order in 2008 for the Mojave and Colorado deserts. When complete it will provide binding, long-term endangered species permit assurances and facilitate renewable energy project review and approval processes. To oversee the implementation of the DRECP, a combined state and federal Renewable Energy Action Team (REAT) was formed consisting of the California Natural Resources Agency, California Energy Commission, California Department of Fish and Game, Bureau of Land Management, and the U.S. Fish and Wildlife Service. Memoranda of Understanding (MOUs) were signed by the participating agencies. Others joining the team include the California Public Utilities Commission, California Independent System Operator, National Parks Service, and the Department of Defense. The draft proposal was released September 26, 2014. Comment period is September 26, 2014 through Friday, January 9, 2015. Exclusion Areas - Areas within Candidate Study Areas and/or Renewable Energy Zones where development is already precluded by statute or regulation (federal, provincial, state or local). Federal Lands Managers - Transmission facilities sometimes pass through federally owned lands; if they do, federal agencies, such as the Department of Interior or the Department of Defense, become involved in the siting process. These federal agencies play a significant role in the transmission siting process because they control such massive swathes of land in the country, particularly in the western United States. Yet, their main mission has little to do with transmission lines. A state siting authority cannot preempt a federal land manager. FERC – Federal Energy Regulatory Commission - Regulates interstate electricity transmission. Section 216 of the Federal Power Act (FPA), which was added in 2005, gives FERC jurisdiction in certain circumstances to issue permits for the construction or modification of electric transmission facilities in areas designated as national interest corridors by the Secretary of Energy. FERC Order 1000 - A Final Rule issued in July 2011 that reforms the Commission’s electric transmission planning and cost allocation requirements for public utility transmission providers. The rule builds on the reforms of Order No. 890 and corrects remaining deficiencies with respect to transmission planning processes and cost allocation methods. The bottom line is it will force larger-scale plans to be produced everywhere. Simply put, FERC is proposing to include "public policy" into the list of criteria regulators can consider when allocating "just and reasonable" costs associated with new transmission. The rule also encourages a more regional approach. Who benefits has been the guiding standard for decades. A group of Senators opposed to the NOPR have submitted legislation that would essentially head off the new rules at the pass. (from ThinkProgress) FERC Order 1000 makes a number of changes to how electricity transmission will be considered in the future. It requires grid investments that affect multiple states and utility jurisdictions to be coordinated — rather than the former system which allowed individual state regulators and utilities to opt in or out of regional efforts. It provides guidance on how to pay for expensive transmission projects and makes the process more flexible to help facilitate growth, especially for renewable efforts. It also eliminates utilities’ first right of refusal, which allowed incumbent utilities to decide first it they wanted to build transmission projects. This will help level the playing field for independent transmission projects. Perhaps most significantly, Order 1000 demands transmission plans account for state-level policies on reducing greenhouse gas emissions and increasing renewable energy production. Currently around 20 states have Renewable Energy Portfolios operating to achieve these goals. Overall the Order is ambitious and aims to accomplish two primary goals: facilitating the coordinated construction of the many new and updated electric transmission lines needed as fossil fuel and renewable energy projects come online in disparate parts of the country, and making it easier for large-scale renewable energy projects to connect to the grid. The EPA’s recent announcement of proposed carbon dioxide regulations for existing power plants, which will be carried out by state-level directives, will likely dovetail well with these new transmission guidelines. Load Center - Major cities or metropolitan areas with large concentrated populations. Load centers consume large amounts of electricity. LSE - Load-Serving Entity - The broad term to describe entities that delivers electricity to end-users and wholesale customers, typically utility companies. MVP - Multi Value Project - A Dec 2010 FERC decision defines MVPs as wires having a regional impact and wide-ranging public benefit. National Electric Transmission Congestion Study - As required by EPACT05, DOE issued the first Study in August 2006. Additional studies are required every three years. The study identified two areas of critical congestion: Southern California and the eastern coastal area from metropolitan New York to Northern Virginia. This congestion study included detailed information on the transmission congestion in the western United States but did not provide comparable detail on congestion in the eastern United States. In determining whether to designate national interest electric transmission corridors, DOE is required to identify transmission congestion that adversely affects consumers. However, EPACT05 does not define “congestion that adversely affects consumers,” nor does it require empirical analysis of the specific adverse effects of transmission congestion. Source: U.S. Department of Energy, National Electric Transmission Congestion Study (2006), p. 33. 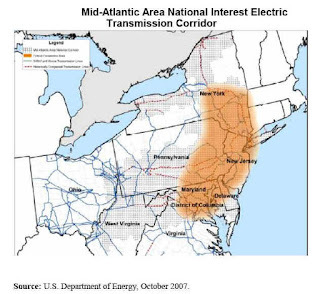 National Interest Electric Transmission Corridor - As a result of EPACT05, DOE designated two corridors on October 2, 2007: The Mid-Atlantic Area National Interest Electric Transmission Corridor and the Southwest Area National Interest Electric Transmission Corridor based on the 2006 congestion study. This designation allows FERC, under certain circumstances to authorize “the construction or modification of electric transmission facilities.” A permit holder would still need to obtain rights-of-way from property owners. If the permit holder is not able to successfully negotiate with each affected property owner, then FERC would entitle a permit holder to acquire the rights-of-way by exercising the right of eminent domain. 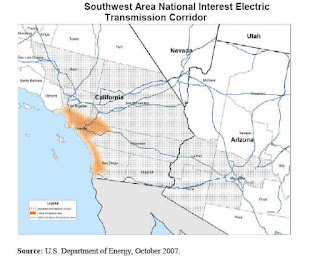 A National Corridor designation itself does not preempt State authority or any State actions, including action to approve or order the implementation of non-transmission solutions to congestion and constraint problems..
NREZ – National Renewable Energy Zones - Proscribed in pending S.539, each NREZ would have the potential to generate in excess of 1 gigawatt of electricity from renewable energy and have an insufficient level of electric transmission capacity to achieve this potential. QRA - Qualified Resource Area - Those lands with the greatest energy density within a contiguous area for each respective state. A QRA excludes any lands with statutory or regulatory development limitations and limitations related to topography, ground cover, or urban settlement. RETI - Renewable Energy Transmission Initiative - An initiative lead by the California Energy Commission to help identify the transmission projects needed to accommodate these renewable energy goals, support future energy policy, and facilitate transmission corridor designation and transmission and generation siting and permitting. Phases 1 and 2 of the RETI project resulted in the identification and refinement of Competitive Renewable Energy Zones (CREZs) that hold the greatest potential for cost-effective and environmentally responsible renewable development. Due to time constraints, several modifications to the RETI analysis were not included in the final Phase 2A report. The final Phase 2B Report, issued in May 2010, documents key changes made in the economic model, technology assumptions, competitive renewable energy zones, and out of-state (OOS) resources. Click here for the RETI Reports page. RETI 2.0 - Update March 2017: The RETI 2.0 Project has concluded with the posting of the Final Plenary Report. Other final reports from the technical input groups, which informed the Final Plenary Report can be found here. The summaries, conclusions, and recommendations in the Final Plenary Report, and in previous RETI 2.0 and products, are intended to inform future state regulatory and policy proceedings and may be useful to renewable and transmission developers, environmental and community groups, and local, regional, and federal government entities. The California Public Utilities Commission and Energy Commission are now engaged in Integrated Resource Planning studies, and the California Independent System Operator is working on their Transmission Planning Process to identify transmission needs. The Energy Commission also initiated the 2017 Integrated Energy Policy Report proceeding. The RETI 2.0 findings will be considered in these planning activities. RETI 2.0 was introduced in September 2015 in response to Gov.Brown's Executive Order B-30-015 and the subsequent Clean Energy and Pollution Reduction Act of 2015 (Senate Bill 350, De León), major policy mandates setting new and ambitious renewable electricity and greenhouse gas (GHG) reduction goals for California. In response to these new goals – a 50 percent Renewables Portfolio Standard (RPS) and a 40 percent statewide GHG emission reduction from 1990 levels by 2030 – the leaders of the state’s energy agencies convened RETI 2.0 to examine where potential new renewable energy generation could be developed and assess what transmission may be needed to deliver this energy to California’s load centers. RETI 2.0 revisits the first RETI process in 2009 when state policy makers were considering increasing the state’s RPS from 20 to 33 percent. REZ - Renewable Energy Zone - Areas with high concentrations of developable renewable energy resources that can meet regional energy demand. Non-REZ resources serve sub-regional or in-state demand. They primarily serve load in the same locality, state or utility service area. They do not need to be concentrated in one place in order to be developed, as development is unambiguously within the regulatory purview of the state where the resource is located. Finally, the ability of any state to develop them is largely unaffected by policies in neighboring states. Supply Curve - A representation of the amount of renewable energy capacity that is economically developable from an area, and the cost at which increments of the total can be developed. The curve depicts projects and potential projects in ascending order according to their busbar costs. A Renewable Energy Zone supply curve includes and identifies all economically developable renewable energy technology categories contained in the REZ. TAC - Transmission Access Charge - Within RTO/ISO markets, most of which have multi-state footprints. The developer transmission owner (IOU or independent Transco) can choose whether or not to recover project costs through the ISO’s TAC. If the owner elects TAC recovery, then project costs are allocated among all load serving entities who are ISO market participants in proportion to the amount of load they serve.The financial transmission rights created by the specific project must be released and made available to all market participants through FERC-approved allocation and/or auction processes. If the owner elects not to recover project costs through TAC (“merchant transmission”), then the owner can obtain a long-term allocation of transmission rights from the ISO that reflects the incremental value of the capacity added by the project to the RTO/ISO controlled grid. This hybrid RTO/ISO cost recovery mechanism seems to be working in practice. Transmission Segment - A transmission segment defines a discrete distance from two points along a transmission path. Transmission segments were identified in the WREZ project to calculate the distances from Renewable Energy Zones to load centers. WECC - Western Electricity Coordinating Council - An organization that promotes and regulates electric reliability across the Western Interconnection. WECC also conducts transmission planning and supports Western power markets. In 2005, peak summer demand for electricity in the Western Electricity Coordinating Council area was 149,147 MW. Western Interconnection - A synchronized electric grid that spans 1.8 million square miles from the Canadian provinces of British Columbia and Alberta, to the northern part of Baja California, Mexico. 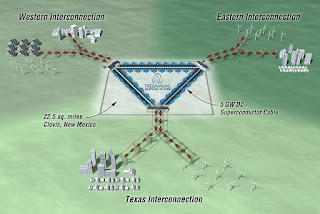 In addition to the Western Interconnection, there are the Eastern Interconnection and the Electrical Reliability Council of Texas (ERCOT) in the United States. WGWC - Western Governors’ Wildlife Council – Established by The Western Governors’ Association to coordinate and oversee implementation of the WGA Wildlife Corridors report endorsed by the Governors in June 2008. Each WGA member Governor appoints a representative to the WGWC. The mission of the WGWC is to identify key wildlife corridors and crucial habitats in the West and coordinate implementation of needed policy options and tools to conserve those landscapes. 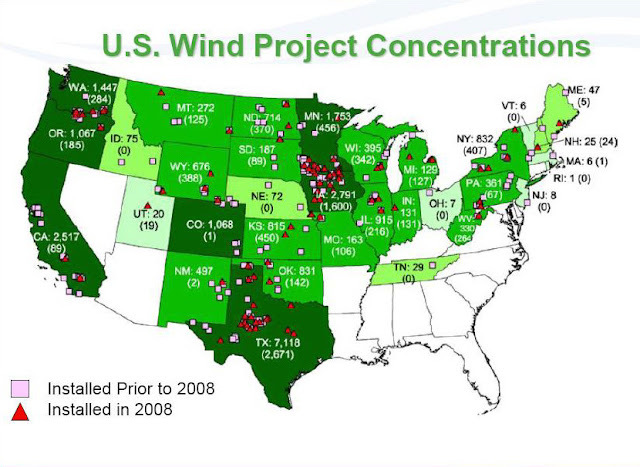 WREZ - Western Renewable Energy Zones – An initiative launched by The Western Governors' Association and U.S. Department of Energy in May 2008. The WREZ seeks to identify those areas in the West with vast renewable resources to expedite the development and delivery of renewable energy to where it is needed. Renewable energy resources are being analyzed within 11 states, two Canadian provinces, and areas in Mexico that are part of the Western Interconnection. A truly national clean-energy smart grid must consist of two distinct components: an interstate sustainable transmission grid that will transport clean utility-scale renewable energy long distances to market, and a digital “smart distribution grid” to deliver this electricity efficiently to local consumers. The absence of a national grid that seamlessly integrates these two components is one of the biggest impediments to large-scale deployment of low-carbon electricity. Federal and State Governments need to implement policies that enhance the quantity of electric transmission capacity available to take full advantage of the renewable energy resources available to generate electricity, and to more fully integrate renewable energy into the energy policies of the United States. Socialization of the costs of transmission requires the utility, and by extension its ratepayers, pay for all the new lines and upgrades to the transmission system. Failure to answer the question of who pays for what investment could stop new investment in transmission in its tracks. Ultimately, electricity customers pay for all the investments in transmission in some way. Increase transparency in the rules applicable to planning and use of the transmission system. A group of Senators opposed to the NOPR have submitted legislation that would essentially head off the new rules at the pass. Hearings have also been requested before the Senate Energy and Natural Resources Committee, but it is unlikely that panel will hold any until the final rule is released. The beneficiary is a major sticking point. Are they limited by proximity? If so, how far? Each public utility transmission provider must participate in a regional transmission planning process that satisfies the transmission planning principles of Order No. 890 and produces a regional transmission plan. Local and regional transmission planning processes must consider transmission needs driven by public policy requirements established by state or federal laws or regulations. Each public utility transmission provider must establish procedures to identify transmission needs driven by public policy requirements and evaluate proposed solutions to those transmission needs. Public utility transmission providers in each pair of neighboring transmission planning regions must coordinate to determine if there are more efficient or cost-effective solutions to their mutual transmission needs. Each public utility transmission provider must participate in a regional transmission planning process that has a regional cost allocation method for new transmission facilities selected in the regional transmission plan for purposes of cost allocation. The method must satisfy six regional cost allocation principles. Public utility transmission providers in neighboring transmission planning regions must have a common interregional cost allocation method for new interregional transmission facilities that the regions determine to be efficient or cost-effective. The method must satisfy six similar interregional cost allocation principles. Participant-funding of new transmission facilities is permitted, but is not allowed as the regional or interregional cost allocation method. This does not apply to a transmission facility that is not selected in a regional transmission plan for purposes of cost allocation. This allows, but does not require, public utility transmission providers in a transmission planning region to use competitive bidding to solicit transmission projects or project developers. Nothing in this requirement affects state or local laws or regulations regarding the construction of transmission facilities, including but not limited to authority over siting or permitting of transmission facilities. The rule recognizes that incumbent transmission providers may rely on regional transmission facilities to satisfy their reliability needs or service obligations. The rule requires each public utility transmission provider to amend its tariff to require reevaluation of the regional transmission plan to determine if delays in the development of a transmission facility require evaluation of alternative solutions, including those proposed by the incumbent, to ensure incumbent transmission providers can meet reliability needs or service obligations. Former Federal Energy Regulatory Commission chief of staff Howard Shafferman, now a lawyer at Ballard Spahr, says in this video interview that while he basic principles of regional transmission planning are widely understood, cost allocation issues will continue to be contentious. In California, the Renewable Energy Transmission Initiative (RETI) identified the transmission projects needed to accommodate these renewable energy goals, support future energy policy, and facilitate transmission corridor designation and transmission and generation siting and permitting. RETI assessed all competitive renewable energy zones in California and possibly also in neighboring states that can provide significant electricity to California consumers by the year 2020. RETI also will identify those zones that can be developed in the most cost effective and environmentally benign manner and will prepare detailed transmission plans for those zones identified for development. RETI 2.0 was introduced in September 2015 in response to Gov.Brown's Executive Order B-30-015 and the subsequent Clean Energy and Pollution Reduction Act of 2015 (Senate Bill 350, De León), major policy mandates setting new and ambitious renewable electricity and greenhouse gas (GHG) reduction goals for California. In response to these new goals – a 50 percent Renewables Portfolio Standard (RPS) and a 40 percent statewide GHG emission reduction from 1990 levels by 2030 – the leaders of the state’s energy agencies convened RETI 2.0 to examine where potential new renewable energy generation could be developed and assess what transmission may be needed to deliver this energy to California’s load centers. RETI 2.0 revisits the first RETI process in 2009 when state policy makers were considering increasing the state’s RPS from 20 to 33 percent. RETI 2.0 - Update March 2017: The RETI 2.0 Project has concluded with the posting of the Final Plenary Report. Other final reports from the technical input groups, which informed the Final Plenary Report can be found here. The summaries, conclusions, and recommendations in the Final Plenary Report, and in previous RETI 2.0 and products, are intended to inform future state regulatory and policy proceedings and may be useful to renewable and transmission developers, environmental and community groups, and local, regional, and federal government entities. The California Public Utilities Commission and Energy Commission are now engaged in Integrated Resource Planning studies, and the California Independent System Operator is working on their Transmission Planning Process to identify transmission needs. The Energy Commission also initiated the 2017 Integrated Energy Policy Report proceeding. The RETI 2.0 findings will be considered in these planning activities. The California-Oregon Intertie (COI) consists of three 500 kilovolt (kV) transmission lines with a rated capacity of 4,800 megawatts (MW) connecting the Pacific Northwest and Northern California. There is currently no existing capacity available for new fully-deliverable resources from either generation in Northern California or imports from the Northwest. Providing new capacity could require new transmission from the Oregon border to the Tracy area, at an order-of-magnitude cost7 of $2 billion-$4 billion. Capacity on the COI could potentially be increased through aadvanced transmission technologies or new transmission elsewhere in the Western Interconnection to reduce regional loop flow. Operational improvements – scheduling coordination and dynamic line rating – could increase the utilization of existing capacity. The hypothetical study range of 5,000 MW would trigger a need for substantial upgrades to the 115 kV or 230 kV network, at an estimated order-of-magnitude cost of $400 million-$500 million. If a large quantity of new generation could be geographically concentrated and connected to the 500 kV system, it could potentially offer lower cost and greater system benefits. RETI 2.0 stakeholders also suggested that the San Joaquin Valley constraints could be an appropriate application of advanced technologies like power flow control. The Desert Area Constraint is a transmission constraint that affects deliverability of new renewable generation from a vast area, including the Victorville-Barstow, Riverside East, and Imperial Valley TAFAs, as well as imports from the Eldorado or Palo Verde import-export paths. This constraint can take different forms – triggered by different contingencies and limiting facilities – depending on the resource development mix from different areas. (LADWP) are currently coordinating to address the most critical of these limitations – an upgrade of the Lugo-Victorville 500 kV line at an approximate cost of $34 million. The second constraint arises at an incremental level of generation of as little as 2,000-4,000 MW (if concentrated in Riverside East) or as high as 5,500 to 8,500 MW (from all affected TAFAs combined). Possible solutions for this limitation could include either a new series compensated 500 kV line between Mira Loma substation in the Inland Empire and the Red Bluff substation near Desert Center or a new 500 kV line between Lugo and Eldorado substations. Either of these projects could have significant permitting challenges and an order-of-magnitude cost of $1 billion. Power flow control technology and advanced conductors could increase capacity, and new transmission elsewhere (for example, Imperial Valley) could provide partial solutions. The constraints to delivering additional renewable resources from (and through) the Imperial Valley include both physical and accounting issues. RETI 2.0 focused solely on physical transmission capacity. 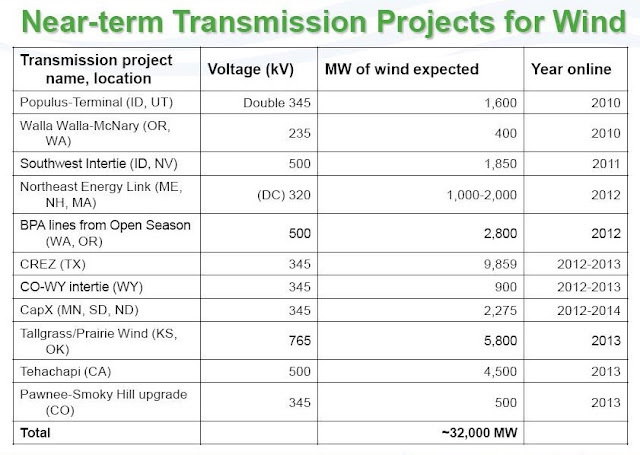 Transmission constraints to delivery of an additional 5,000 MW include the ECO- Miguel line to the west of Imperial Valley and Path 42 to the northwest between Imperial and Coachella Valleys. Six conceptual transmission proposals were identified by TTIG members that could allow for increased energy export from (and through) the Imperial TAFA. These projects may also provide reliability benefits to the southwest United States and improve import and export capability to Arizona, New Mexico, and Baja California Norte. Generation in Imperial Valley would also contribute to the Desert Area Constraint. Generation development north of the Kramer substation (San Bernardino County) could result in constraints between Kramer, Lugo, and Calcite substations. These constraints could be mitigated with upgrades such as a teardown and rebuild of the CalciteLugo 220 kV line, a new Lugo 500/220 kV transformer bank, and either a new Coolwater- Lugo 220 kV line or a new Kramer-Llano 500 kV line. Stakeholders suggested that power flow control technologies could also assist in this area. These three interconnections to Nevada are each relatively weak and would require new capacity. 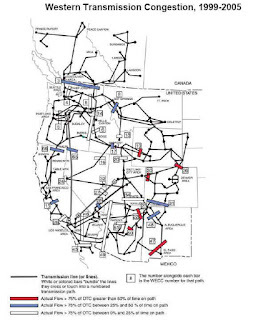 The Lassen Municipal Utility District has proposed a new line to connect Path 76 (Reno-Alturas) to the COI, but the line would face extensive permitting challenges, and energy delivery would still be subject to the existing constraints on the California-Oregon Intertie. An upgrade of Path 24 between Truckee and Reno would be subject to extensive environmental constraints. A conceptual project to add between 750 and 1,000 MW capacity to Path 52 in Owens Valley was suggested by a Nevada study in 2012 at an approximate cost of $600 million. National Security - enhances national energy security; conserves water and finite resources. Reduced Curtailments, - For example, wind farms in West Texas get curtailed routinely at night because there’s not enough transmission capacity. It leads to storage economics and other things, as well as the C/Res zones. If we can reduce the system costs associated with renewable energy, whether it’s transmission capacity, or additional controls, or operating measures then that’s good. Transmission for Renewables is Relatively Expensive - Wind and Solar have capacity factors well on the low side of 40% meaning the lines are several times larger than the average power output demands so the cost per MWh-mile is a lot higher. In addition, these lines are a lot longer than would be required to be run from more conventional plants to load centers. Cost Allocation - Cost allocation reform is one of the most difficult issues facing transmission service providers and regional market operators. FERC is proposing to include "public policy" into the list of criteria regulators can consider when allocating "just and reasonable" costs associated with new transmission. The rule also encourages a more regional approach. Who benefits has been the guiding standard for decades. The controversy has spawned a contentious debate, with advocates of a narrower view of regulators' discretion would codify a more narrow definition of beneficiaries. A permanent loss of habitat for protected wildlife species and special status plants would occur. The availability of adequate mitigation land to compensate is uncertain, especially for expansive solar projects. Large projects would create blockage of wildlife corridors, potentially constraining or eliminating important linkages between sensitive population groups. Birds and bats can collide with wind turbines if located in areas with notable or threatened avian populations. A permanent change in the visual character of open spaces or agricultural areas would occur, inserting large expanses of industrial features to previously uninterrupted vistas. Desert views would also be affected by glare from the mirrors and towers used in some solar thermal technologies. Wind turbines would alter hilltop and ridgeline views. Limited supplies of groundwater would be used for regular cleaning of thousands of mirrors and panels for solar installations. Public lands in the desert would be converted from open space, available for multiple uses such as recreation, mining, and grazing, to a single exclusive purpose – power generation. A cumulative loss of resources would occur as the impacts above are realized throughout California – especially in the desert, where over 100 projects are already proposed. Fragmented Decision Making - Existing transmission planning processes are fragmented across many jurisdictions, which results in difficult coordination between jurisdictions, delays in implementation of plans, and complex negotiations on sharing of cost. The Federal Government has not adequately supported or implemented an integrated approach to accelerating the development, commercialization, and deployment of renewable energy technologies, renewable electricity generation, and transmission to bring renewable energy to market. The fact that power lines traverse federal and tribal lands also may complicate the process. Fragmented Utility Industry Structure - Before deregulation, the power industry consisted mainly of companies that owned and operated power plants and power lines. There was no question about who would build new power lines to connect to new power plants; the same company built and operated all the lines and the power plants within its system. The new power industry consists of many power plants, built and owned by independent companies; power lines are owned by regulated companies. Generating companies must connect their power plants to the power grid. The challenge is to allocate those costs among the generators and the regulated transmission companies. The transmission company that builds the lines bears risks associated with recovering costs in the regulatory process. That company also must raise the money to make the investment. Funding Models - The wind industry has been strongly pushing for state, regional, and federal policy solutions to more broadly distribute the costs of transmission investments, as FERC’s ruling does today. 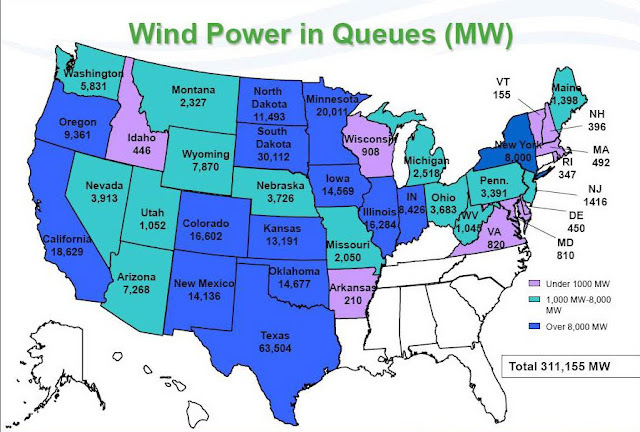 Unfortunately, other regions of the country are considering policies aimed in the opposite direction, moving back towards a model requiring the next wind plant waiting in line to connect to the grid to pay for all of the cost of upgrading the grid. According to AWEA, such a policy is akin to requiring the next car entering a congested highway to pay the full cost of adding a new lane. States Rights - Is electricity a local business or is it a regional or national business? There has been push-back in the courts on FERC review of state transmission planning decisions. On Feb 18, 2009, in the U.S. Court of Appeals, Fourth Circuit, two state utilities commissions and two community interest organizations petitioned for review of several rulemaking decisions made by FERC . The Coalition for Fair Transmission Policy — an industry group made up of 10 big utilities including Southern Co., Consolidated Edison, Alliant, DTE Energy, PPL, Progress Energy and PSEG — says it will lobby to change proposed Senate legislation that it says could unfairly spread the costs of building big new transmission lines across multiple states. Or, to put it another way, “states and regions that get the benefits of new transmission should be the ones to pay for them. NIMBY - Not In My Backyard - Most people probably would prefer that transmission companies build new transmission lines where no one can see them. Transmission owners often find it difficult to identify acceptable transmission routes because few property owners welcome the prospect of having new transmission lines constructed nearby. Geography - Space for new transmission lines may be limited. Even in areas that have a preexisting right-of-way for a transmission line, new population growth may make it difficult to install new, larger towers and lines. Gold Plating - More utility investment than is necessary to ensure reliability. Lack of Transmission Data - Data collections that the Federal Government relies on to monitor reliability have not kept pace with the ascendancy of transmission in a restructuring industry. The Government does not have the electrical models and data necessary to verify that existing and planned transmission capability is adequate to keep the lights on. Lack of Retail Price Signals - Until we have meaningful, relevant retail price signals and retail choice for retail consumers, it is impossible for us to know the economic value of additional transmission infrastructure. That, combined with the high level of political lobbying from Boone Pickens and others, leads me to be extremely cautious in recommending large-scale transmission infrastructure construction. What if we spend lots of money (including taxpayer money) building this network, and it turns out we were wrong about its economic value? Then we’ve just created another set of stranded assets. Uncertainties in Carbon Policy - We cannot know the economic value to retail consumers/taxpayers of additional transmission infrastructure connecting large-scale renewables until we have an economically meaningful carbon price, which implies that carbon policy uncertainty should be resolved before we start long-distance transmission planning. Interference - Railroads are concerned about the potential for electromagnetic interference, if AC transmission lines are run along rail right of ways. HVDC lines don’t have these interference issues. Any agreements would probably have to be negotiated with individual U.S. railroads. Seamless Regulatory System - It is critical that both states and the federal government set clear rules about who will pay for what. Without clear rules, many transmission companies will hesitate to build new transmission capacity, and generators will hesitate to build new power plants, potentially threatening reliability. Establish clear and complete filing requirements for siting proceedings. Single State Entity Responsible for Transmission Siting Approval - In a few states, several government entities have responsibility to approve transmission siting proposals. Complete, Funded Studies - Establish a fee structure whereby applicants pay for the costs of the studies required in the siting process. Ensure that the siting authority’s analysis takes into account a “what if” analysis, considering other options to meet a perceived need. Demand for electricity is volatile, despite forecasters’ best efforts to predict it. Siting proceedings may work for the best results if they allow for sensitivities from demand forecasts. Integrate generation and transmission planning; add demand resources. Include transmission corridors in urban growth plans. Inter-State Collaboration - Enable state siting authorities to collaborate with comparable agencies in other states to review projects that cross state lines. Some transmission lines cross state boundaries, yet most state siting authorities can review only the part of the line located in their state. Coordinate state permitting processes with federal processes. Time Limit for Decision Making - Set a statutory limit for the time allowed to consider a transmission siting application. Identify REZ - Identify important scenic, ecological, environmental and other resources. With this information, transmission companies can avoid these areas or mitigate the visual effects of their proposals if these areas cannot be avoided. Transparency - Integrate the public into consideration of siting proposals. Define considerations that can be evaluated and discussed in a transmission line siting case. Retail Rates - Impose retail rates that reflect actual cost differences within a service territory to promote sound siting proposals. Examine the interactions between rate caps and rate freezes and investments in transmission. Tres Amigas - Clovis New Mexico- Will unite the nation's electric grid. Utilizing the latest advances in power grid technology, Tres Amigas is focused on providing the first common interconnection of America's three power grids to help the country achieve its renewable energy goals and facilitate the smooth, reliable and efficient transfer of green power from region to region. WIRES (Working group for Investment in Reliable and Economic electric Systems) Washington, DC - A non-profit trade association of transmission providers, customers, and equipment and service companies formed to promote investment in electric transmission and progressive State and Federal policies that advance energy markets, economic efficiency, and consumer and environmental benefits through development of electric power infrastructure. Western Renewable Energy Zones - Phase 1 Report:Mapping concentrated, high quality resources to meet demand in the Western Interconnection's distant markets Publication number DOE-1000-2009-011. Documents posted here are reports and related materials. Presentations and documents prepared for and/or presented at meetings or workshops are posted under the event date for which they were prepared and presented. Renewable Energy Transmission Initiative 2.0 Plenary Report - Final Report. Appendix A - Transmission Assessment Focus Area Information. Notice of Webinar and Meeting - Posted: December 16, 2016. Agenda of Webinar and Meeting - Posted: December 27, 2016. Renewable Energy Transmission Initiative 2.0 Plenary Report - Public Review Draft. Posted: December 16, 2016. Workshop Recording - (MP4, 107 MB) Posted: August 17, 2016.